Forest elephants are a keystone species in the Central African rainforests where they reside and perform many ecological services that are vital for the ecosystems’ proper functioning¹. The recent decline in elephant populations, caused by poaching, may have cascading consequences that could reshape the forests’ structure and adversely impact the countless other species they share these biodiversity hotspots with. A recent study by Dr. John Poulson of Duke University analyzed the various local and global ramifications of the forest elephant’s increasingly threatened status¹. One of the most important services elephants provide is seed dispersal. After elephants consume fruits and berries they transport their seeds over large distances and then deposit them in new locations together with a supply of dung that serves as excellent fertilizer¹. Other species also disperse seeds but elephants are unique as they transport seeds the farthest², consume the most seeds, and consume a wider variety of seeds by comparison to other rainforest animals³. The latter is largely because they can eat fruits with tough coverings and robust chemical defenses which are inaccessible to most other species. Plant species which produce such fruits primarily rely on large herbivores, like elephants, for reproduction⁴. Dr. Poulson believes that elephant population declines will beget a shift in the forests’ plant community structure towards species which don’t require animals’ assistance to reproduce. Smaller tree species will also become more prominent since large ones tend to have more durable seed encasings. If forests have fewer large trees they will be less able to store carbon. This could have global implications as unstored carbon will be released into the atmosphere and contribute to climate change. Dr. Paulson suggests that the effects will be similar to what happened after the Pleistocene Extinction when most large mammals, including mammoths, died out¹. 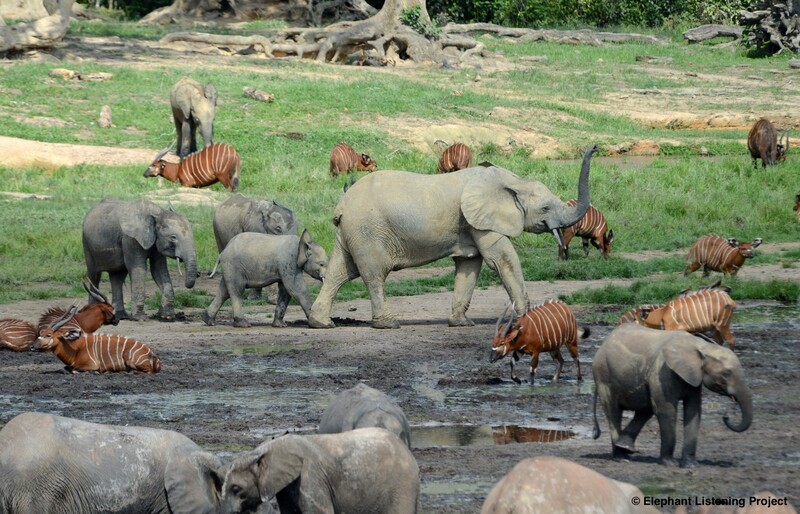 Elephants also engineer ecosystems with the disruption caused by their movements and feeding behavior. For example, they frequently break off tree limbs and branches⁵. This thins the canopy thereby allowing smaller tree species and younger plants to access sunlight⁶. Furthermore, by trampling plants in the understory, elephants create open patches of land where dispersed seeds can take hold and grow which stimulates plants’ colonization of new locations⁷. In addition, elephants’ feeding behavior selects for species that grow fast and quickly bypass the more vulnerable stages of their life cycles. Without elephants there will likely be a shift towards slower growing species that are shade tolerant⁸. Trees will therefore grow more densely and face more competition. Ultimately, this will cause them to not grow as tall and have a lower carbon storage capacity¹. Another function elephants perform is nutrient cycling. Elephants consume a wide variety of foods and then deposit their nutrients throughout the forest when they defecate. This helps keep the soil’s nutrient composition homogeneous¹. Elephants (and other large mammals) essentially act as the forest’s “arteries” by ensuring each part of it is getting sufficient amounts of the nutrients necessary for plant growth and survival⁹. Without elephants the forest’s soil would be less fertile which could lead to slow growing plants becoming dominant. Since tropical plants require a large amount of nutrition in the early stages of their life cycle this service is especially important in rainforests¹. Overall, Dr. Paulson argues that these effects will culminate in rainforests being less healthy and capable of supporting biodiversity¹. Central Africa’s rainforests are the second largest in the world and multiple portions of it are classified as World Heritage Sites¹⁰. Protecting forest elephants is necessary not just for their own sake but for that of the numerous other organisms they share these ecosystems with and who depend on the essential services they provide. ¹Poulsen, John R., Cooper Rosin, Amelia Meier, Emily Mills, Chase L. Nuñez, Sally E. Koerner, Emily Blanchard, Jennifer Callejas, Sarah Moore, and Mark Sowers. “Ecological consequences of forest elephant declines for Afrotropical forests.” Conservation Biology 32, no. 3 (2018): 559–567. ²Sekar, Nitin, Chia-Lo Lee, and Raman Sukumar. “In the elephant’s seed shadow: the prospects of domestic bovids as replacement dispersers of three tropical Asian trees.” Ecology96, no. 8 (2015): 2093–2105. ³Campos-Arceiz, Ahimsa, and Steve Blake. “Megagardeners of the forest–the role of elephants in seed dispersal.” Acta Oecologica 37, no. 6 (2011): 542–553. ⁴Feer, François. “Morphology of fruits dispersed by African forest elephants.” African Journal of Ecology 33, no. 3 (1995): 279–284. ⁵Rode, Karyn D., Patrick I. Chiyo, Colin A. Chapman, and Lee R. McDowell. “Nutritional ecology of elephants in Kibale National Park, Uganda, and its relationship with crop-raiding behaviour.” Journal of Tropical Ecology 22, no. 4 (2006): 441–449. ⁶Laws, Richard M. “Elephants and habitats in north Bunyoro, Uganda.” African Journal of Ecology 8, no. 1 (1970): 163–180. ⁷Omeja, Patrick A., Aerin L. Jacob, Michael J. Lawes, Jeremiah S. Lwanga, Jessica M. Rothman, Charles Tumwesigye, and Colin A. Chapman. “Changes in elephant abundance affect forest composition or regeneration?.” Biotropica 46, no. 6 (2014): 704–711. ⁸Poulsen, John R., Connie J. Clark, and Todd M. Palmer. “Ecological erosion of an Afrotropical forest and potential consequences for tree recruitment and forest biomass.” Biological Conservation 163 (2013): 122–130. ⁹Doughty, Christopher E., Adam Wolf, and Yadvinder Malhi. “The legacy of the Pleistocene megafauna extinctions on nutrient availability in Amazonia.” Nature Geoscience 6, no. 9 (2013): 761.